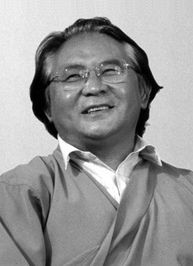 Sogyal Rinpoche (Tibetan: བསོད་རྒྱལ་, Wylie: Bsod-rgyal) was born in the Tibetan Fire Pig year (1947-8) and raised by one of the most revered spiritual masters of this century, Jamyang Khyentse Chökyi Lodrö, who recognized him as the incarnation of Tertön Sogyal Lerab Lingpa (1856-1926). With the Chinese occupation of Tibet, he went into exile with his master, who died in 1959 in Sikkim in the Himalayas. After university studies in Delhi, India, and Cambridge, England, he acted as translator and aide to several leading Tibetan masters and began teaching in the West in 1974. Rinpoche sees his life's task in transplanting the wisdom of Buddha to the West by offering training in the vision set out in The Tibetan Book of Living and Dying. This Sogyal Rinpoche (Tibetan: བསོད་རྒྱལ་, Wylie: Bsod-rgyal) was born in the Tibetan Fire Pig year (1947-8) and raised by one of the most revered spiritual masters of this century, Jamyang Khyentse Chökyi Lodrö, who recognized him as the incarnation of Tertön Sogyal Lerab Lingpa (1856-1926). With the Chinese occupation of Tibet, he went into exile with his master, who died in 1959 in Sikkim in the Himalayas. After university studies in Delhi, India, and Cambridge, England, he acted as translator and aide to several leading Tibetan masters and began teaching in the West in 1974. Rinpoche sees his life's task in transplanting the wisdom of Buddha to the West by offering training in the vision set out in The Tibetan Book of Living and Dying. This training can enable those who follow it to understand, embody, and integrate Buddhist teachings into their everyday lives. “Perhaps the deepest reason why we are afraid of death is because we do not know who we are. We believe in a personal, unique, and separate identity — but if we dare to examine it, we find that this identity depends entirely on an endless collection of things to prop it up: our name, our "biography," our partners, family, home, job, friends, credit cards… It is on their fragile and transient support that we rely for our security. So when they are all taken away, will we have any idea of who we really are? “We are fragmented into so many different aspects. We don´t know who we really are, or what aspects of ourselves we should identify with or believe in. So many contradictory voices, dictates, and feelings fight for control over our inner lives that we find ourselves scattered everywhere, in all directions, leaving nobody at home. Which book would you like to read for September's Classic category group read? Is this you? Let us know. If not, help out and invite Sogyal to Goodreads.